Transportation to Long Beach Airport should be private, prompt and relaxing. Masters Limousine offers unparalleled Long Beach limo service by catering to clients with discretion and courtesy. From our on-demand chauffeurs to friendly staff, we our luxurious and professional service takes care of all your traveling needs to Long Beach Airport and across the globe. 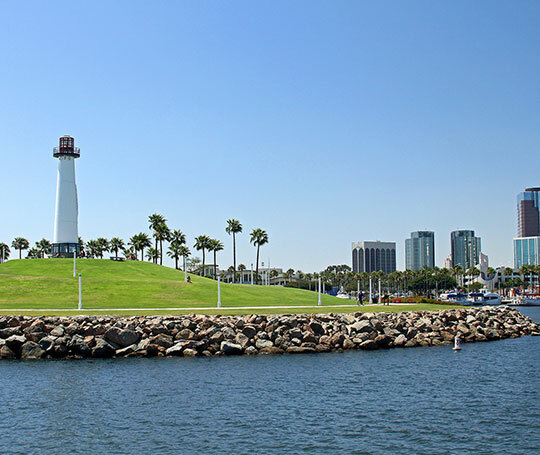 Our Long Beach airport transportation services are ready to LGB airport and more. We also offer executive car services, green hybrid vehicles, cruise transportation in Long Beach. Reserve your next limo service in Long Beach, CA, with Masters Limousine. Whatever your destination, Masters Limousine is here to make your trip smooth and hassle-free. We have more than 20 years experience in Long Beach transportation services and offer the highest quality in limousine and executive services in Southern California. Our private point-to-point transportation services in luxury late-model vehicles make your trip to Long Beach Airport completely stress-free. We offer chauffeured limousine and sedan services all throughout Long Beach, including: Lakewood, Torrance or Redondo Beach. Masters provides airport to airport transfers to all airports in Los Angeles. We offer airport transfers from Long Beach Airport to LAX, Ontario International Airport, Bob Hope Airport, and John Wayne Airport. Reserve a LGB limo to LAX today! Choose from luxury sedans, SUVs, passenger vans, and more. We even have green transportation options in Long Beach. At Masters Limousine we guarantee on-time service and 24-hour availability throughout the Long Beach, Orange County, and Greater Los Angeles areas. Our company offers the most competitive rates in Southern California fro Long Beach airport car services as well as discounts, group account rates, a Frequent Rider Program and VIP services. Masters Limousine can provide executive protection services, celebrity transportation and private hourly charters. We exercise discretion and professionalism in all aspects of our business, bringing you a luxury experience without any stress. Book your next LGB airpot limo with us! The integrity, reliability, and commitment to excellence of Masters Limousine extend beyond our role as the leader in Southern California limousine services. We’re more than just Long Beach Airport limousines, too. Through our partnerships we have a global presence across more than 550 cities worldwide. From LGB Airport or LAX, we can service all your airport transfer needs. Whether you’re in need of Long Beach limo service or travel arrangements internationally, Masters Limousine can handle it all. Please call us for Long Beach travel arrangements or book a reservation online. Explore our website or mobile app for more information on services and contact our courteous staff with any questions. Masters Limousine is here to make your travel experience at Long Beach Airport prompt, discrete and luxurious. Book your next Limo Service in Long Beach, CA, with us!